Photos by Wiebe Nijland (left) and Jenn Burt (right). 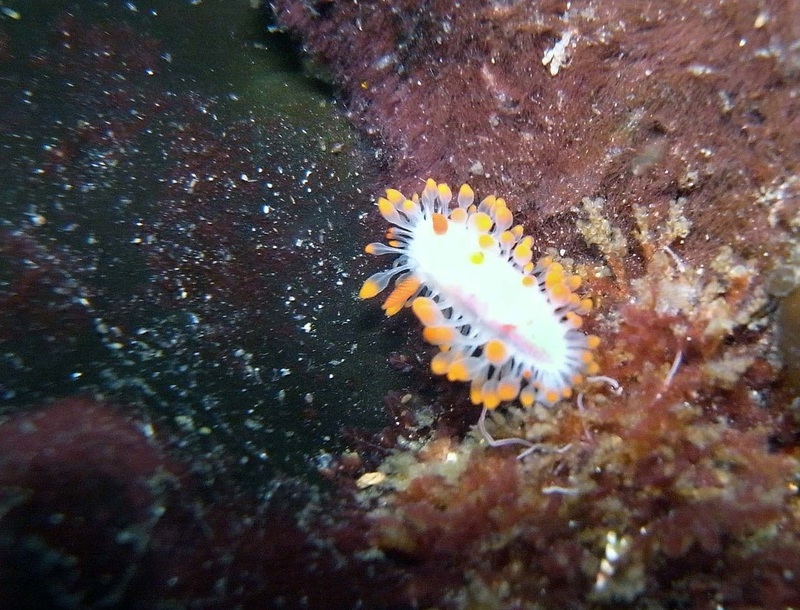 Cockerell's nudibranch is a small and distinctive nudibranch. It reaches just 2.5 cm long and is easily identified by its long white papillae with bulbous orange tips. Its rhinophores are orange as well. Its body varies from greyish-white to cream, and bears scattered small white or orange tubercles. Colour variations exist, including one with more orange on the body and papillae; these colour variations may represent multiple species, though currently only one species is recognized. 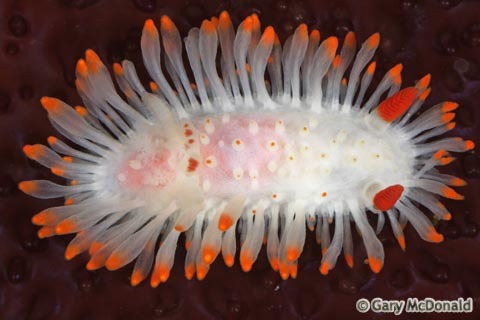 This nudibranch lives in rocky areas, particularly near bryozoans on which it feeds, in the intertidal and subtidal to a depth of 35 m. Its range extends from southern Alaska to northern Mexico. 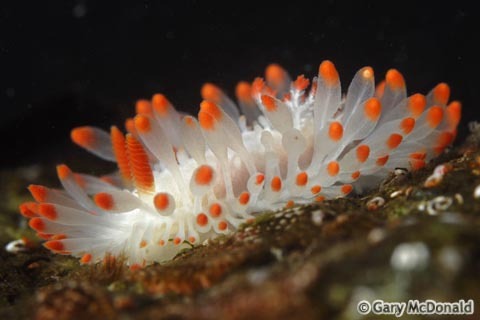 The clown nudibranch (Triopha catalinae) is similar in colour but has shorter orange tubercles instead of long orange-tipped papillae. Cowles, D. (2014). Limacia cockerelli (McFarland, 1905). Invertebrates of the Salish Sea. Rosario Marine Laboratory. Accessed 20/02/2015. Harbo, R. M. (2011). Whelks to whales: Coastal marine life of the Pacific Northwest [revised]. Madeira Park, BC: Harbour Publishing. P. 152. McDonald, G. Limacia cockerelli (MacFarland, 1905). 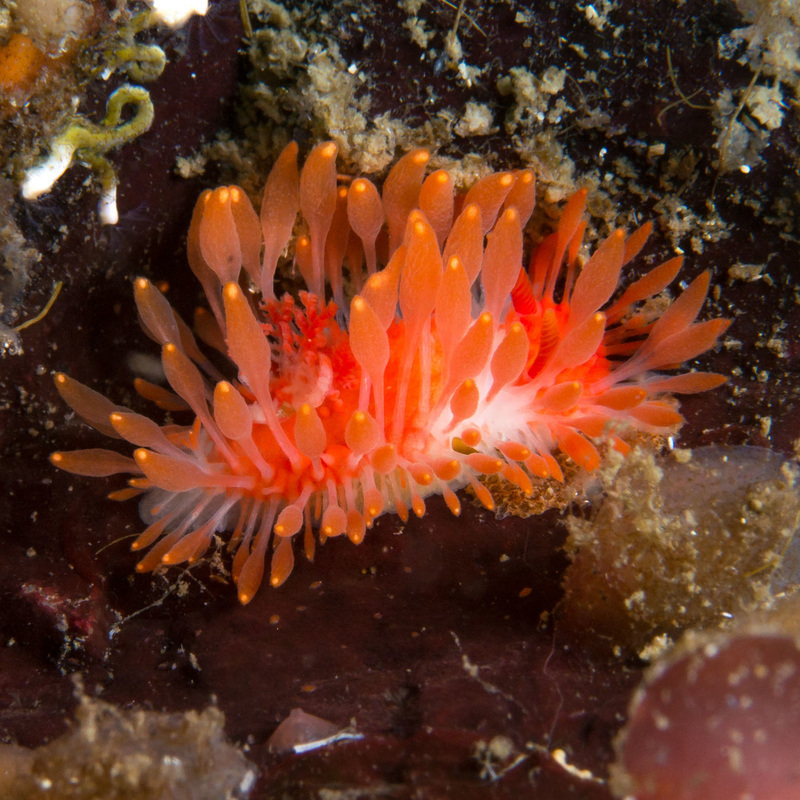 Intertidal Invertebrates of the Monterey Bay Area, California. Long Marine Laboratory, University of California, Santa Cruz. Accessed 20/02/2015. Kelly Fretwell and Brian Starzomski (2015).